These polishing pads are available in limited quantities at closeout prices. Exceptional quality from our European factory. Contact us for more information. 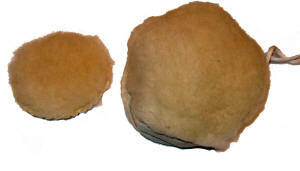 These lambs wool bonnets are excellent for buffing and polishing. 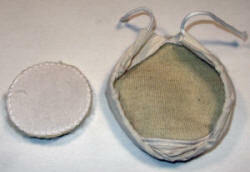 5 inch Wool Bonnet with draw string for mechanical attachment to back up pad. 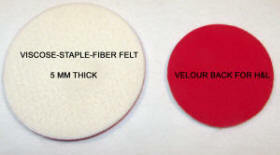 These felt polishing pads feature 3/16" thick viscose staple fiber felt with a velour backing for hook & loop attachment to the tool backup pad. 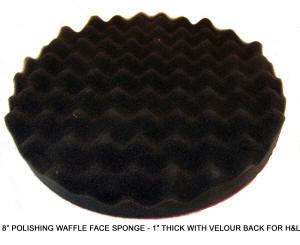 8 inch waffle face polishing sponge with velour back for hook & loop attachment.